BBC NEWS | Entertainment | Chris Moyles: Radio 1 saviour? Chris Moyles: Radio 1 saviour? Chris Moyles has been named as the new breakfast host on BBC Radio 1 - one of the most prestigious slots on British radio. A few months ago, he was voted "most irritating DJ" in a national survey - but that has not stopped Chris Moyles' steady rise. His irreverent style and anarchic afternoon shows have won him a loyal fan base since he emerged at the tail-end of the 1990s. Moyles represents the post-Chris Evans generation of DJs, characterised by laddish humour and a lack of deference that has sometimes got him into deep water. Like the time when he joked he would sleep with singer Charlotte Church. That landed him in trouble with the Broadcasting Standards Commission - and it was not his first brush with the watchdog over suggestive sexual comments. The near-the-knuckle humour for which his fans revere him will now be tested on Britain's second biggest radio breakfast audience (it was the largest until Sara Cox was overtaken by Terry Wogan on BBC Radio 2 last year). Like Cox and Evans before him, it is a fair bet that his output will cause a few splutters over the cornflake bowls of middle England. Moyles started his radio career at the age of 16 on Aire FM in Leeds and honed his skills for six years on stations such as Radio Luxembourg and London's Capital FM. In 1997, he was voted as one of the Faces for '97 by Sky Magazine. His outspoken style worked well in London and he came to the attention of Radio 1 bosses. Chris' first stint on Radio 1 in July 1997 was at 0400 on the pre-breakfast show, styling himself The Saviour of Early Morning Radio. After nine months at the station he was given the Silver Sony Radio Award for DJ of the Year and moved to the late afternoon show. Sun readers voted him DJ of the year for his lively, unpredictable shows alongside producer Will and sidekick Comedy Dave. 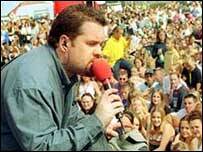 Despite his success on the airwaves, the transition to TV - on Five's Live With Chris Moyles - did not prove as smooth. His stint on the Chris Evans-produced evening chat show came to an end in January after just four months, following poor ratings and stinging reviews. It was clearly not seen as a setback at Radio 1 where Moyles has now reached the pinnacle of his career. With the collapse of the breakfast show's listening figures over the last year, his appointment may yet prove a shrewd gamble by station bosses. Who should host the Radio 1 breakfast show?